Now this is cool. Some of the hype over Google Wave has died down over the last few weeks, in no small part because most people have absolutely no idea how to use it (no, the 80 minute long video demo doesn’t help). Now it looks like the Wave team has another idea up their sleeves to show people the power of Wave: they’re using it to recreate famous documents. 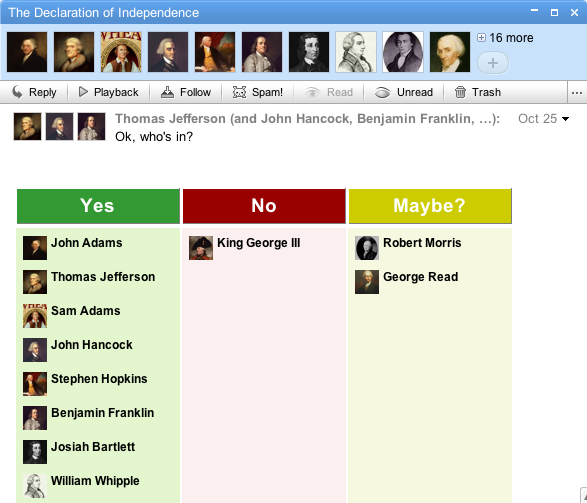 This time they’ve reconstructed the Declaration of Independence, complete with edits and comments from the founding fathers. My US History is a bit fuzzy, but there are plenty of obvious jokes nestled in here, and I’m sure the Googlers have included a few more subtle ones as well. Unfortunately, it looks like you’ll have to have a Wave account if you want to witness the creation of one of the United States’ most important documents. But we’ve tried to grab a few of the key moments in the screenshots below. As a demonstration of what you can do with Wave, the document succeeds in some respects. But frankly it can still be confusing to tell what’s going on. For example, when the founding fathers are casting their votes, the Wave only says something vague like “Thomas Jefferson edited this message” — it’s up to you to figure out what he did. According to a tweet a few minutes ago from Wave team member Lars Rasmussen, the idea to create famous documents came from Tim O’Reilly. Hopefully we’ll be seeing more of these soon.